A circular ink cake with a design of craggy mountains, two trees and an osprey, in the lower left, all within a wide, raised, flat border. 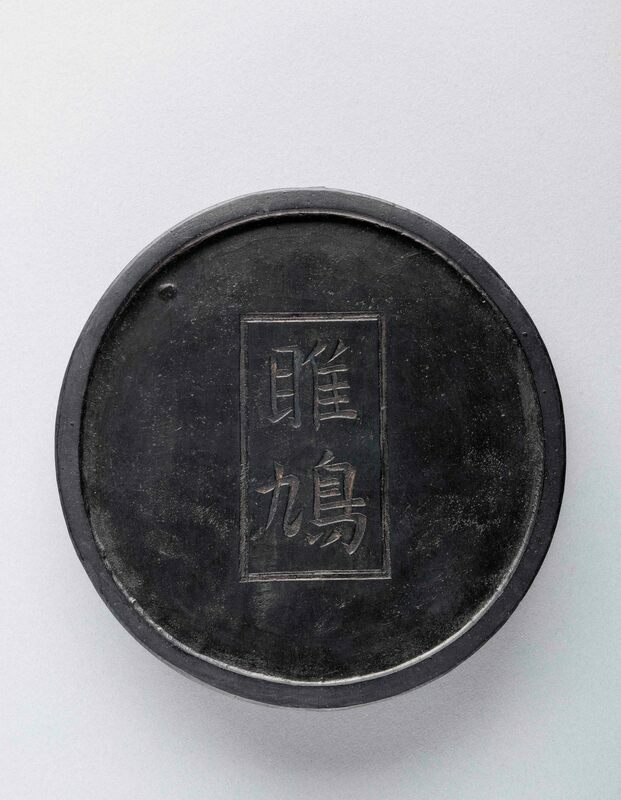 The reverse has a central rectangular cartouche with two characters, 雎鳩Jujiu(osprey). 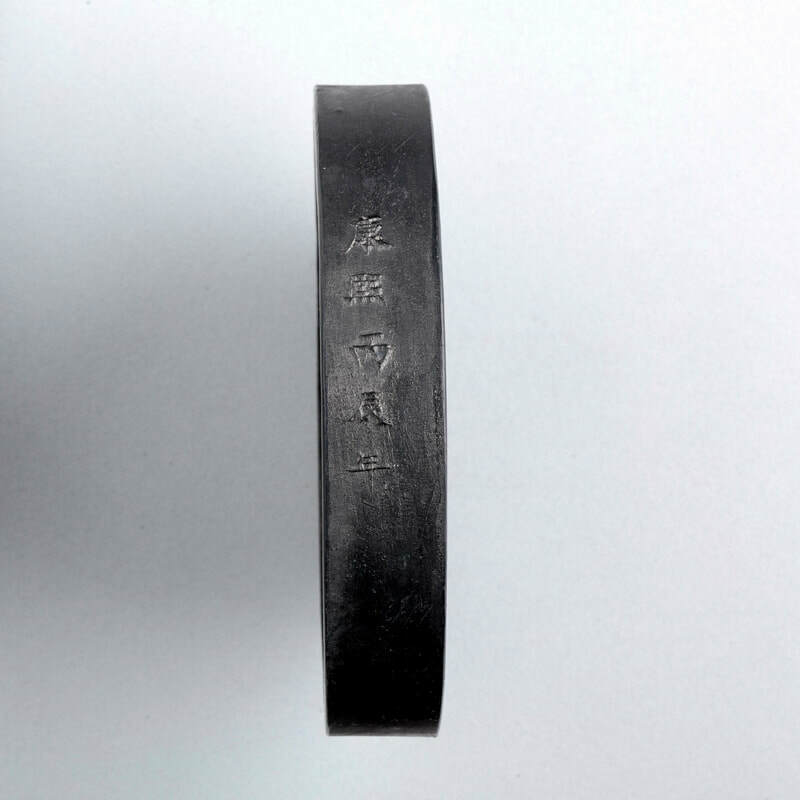 The right side of the ink has a raised moulded inscription, 臣彭定求恭製,“Produced with respect by your servant Peng Dingqiu,” and the left side of the ink has another raised moulded inscription, 康熙丙辰年“The bingchenyear of Kangxi’s reign,” corresponding to 1676. China. 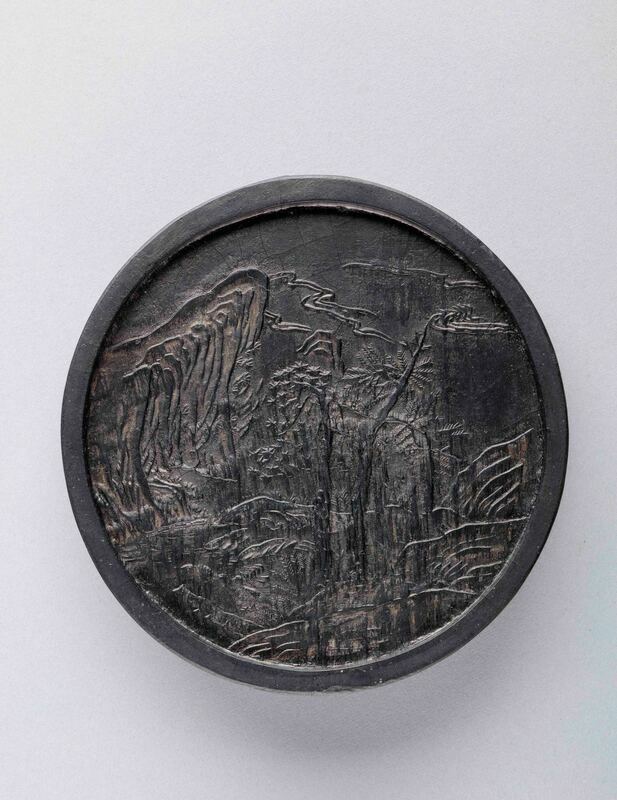 Qing dynasty, Kangxi period, dated 1676. The Peony Collection, Hong Kong. Peng Dingqiu (1645–1719), also named Peng Qinzhi 彭勤止and Peng Nanyun 彭南畇and born in Suzhou, was the zhuangyuan, the top-ranking candidate in the highest imperialexamination, in the fifteenth year of the reign of Emperor Kangxi (1676), the same year that this ink cake was produced. Hewas appointed xiuzhuan 修撰(senior compiler) in the Hanlin Academy 翰林院to assist inwriting imperial history.